comic strip with two panels, in multiple rows. above each row is a line that says "if you want to say... don't say..."
"if you want to say"
inside: a speech bubble saying "thank you"
inside: a wobbly speech bubble saying "sorry"
inside: one person, sweating and leaving a dust cloud, runs up to another who is sitting with arms and legs crossed, waiting. The running one says "thank you for your patience" and the waiting one says "cool." inside: one person looks down and says in a wavy speech bubble "sorry I'm ALWAYS late" to another who is sitting with arms and legs crossed, waiting. The waiting one says "whatevs"
inside: a person smiles and, with both hands over their heart, says "thank you for understanding me" to someone sitting across the table from them. inside: a person with their head in their hands and eyes looking down says "sorry I'm not making a lot of sense" in a wavy speech bubble. inside: a person smiles at someone out of the frame, who is saying "thank you for spending time with me." 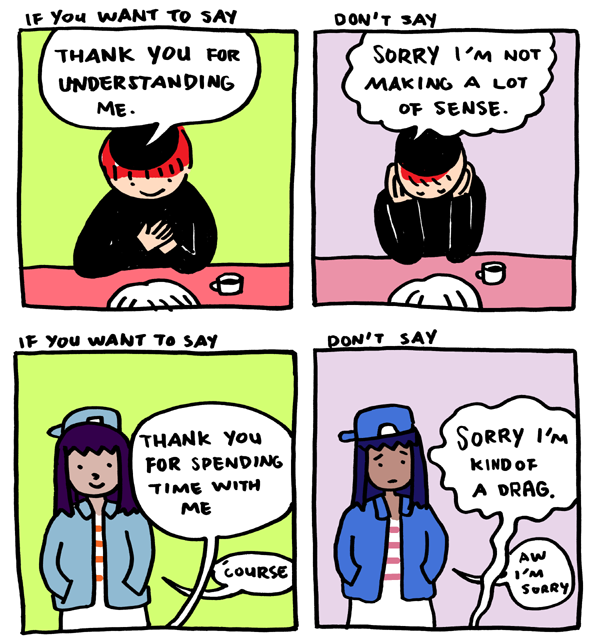 the smiling person says "[of] course"
inside: a person looks very concerned at someone out of the frame, who is saying "sorry I'm kind of a drag" in a wavy speech bubble. The concerned person responds "aw I'm sorry"
inside: two people sit on the grass facing each other. One gestures widely, smiling and saying "thank you for listening." the other smiles. inside: two people sit on the grass facing each other. One has their legs drawn up to their chest with a dejected expression while saying "sorry I'm just rambling" in a wavy speech bubble. The other looks concerned, with a frown and eyebrows raised. inside: a person smiles and says "thank you for appreciating me"
inside: a person looks to the side and says "sorry I take up so much space" in a wavy speech bubble. 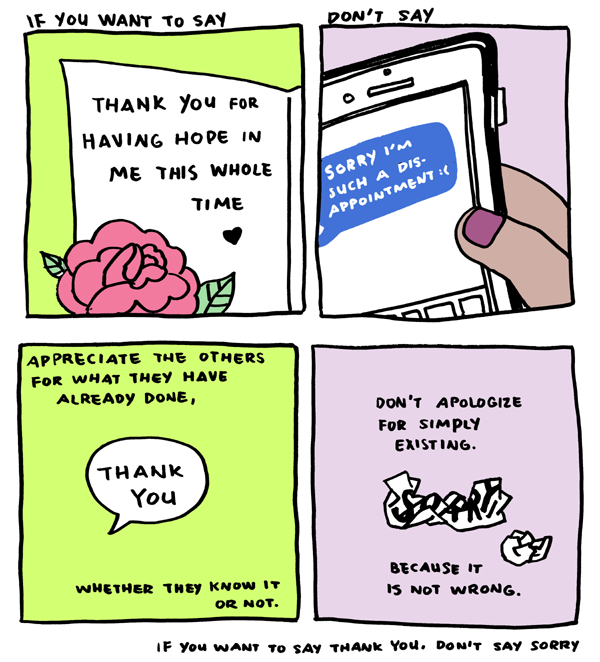 inside: next to a rose, a card is open revealing the message "thank you for having hope in me this whole time"
inside: a person holds a cell phone which has a text message displayed, reading "sorry I'm such a disappointment [sad face emote]"
first panel is yellow, and says "appreciate the others for what they have already done whether they know it or not" and there is a speech bubble that says "thank you"
second panel is pale lavender and says "don't apologize for simply existing. because it is not wrong." In between the sentences there is a crumpled piece of paper with the word "sorry" on it. 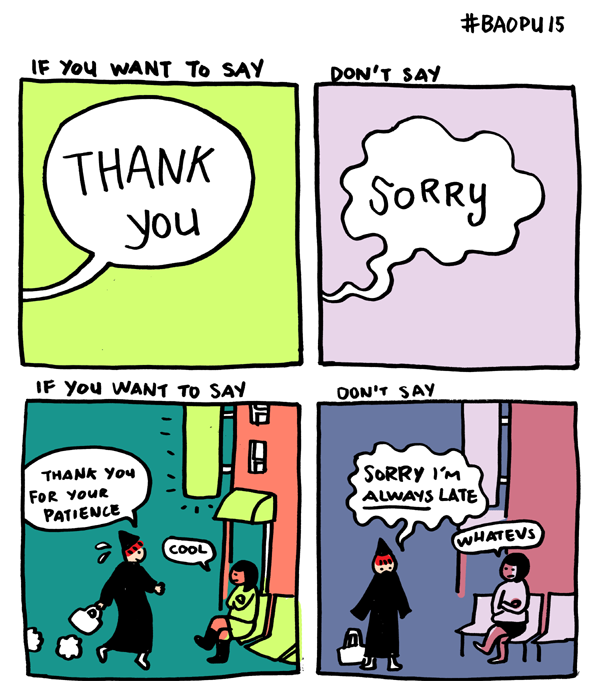 at the end of the image are the words "if you want to say thank you, don't say sorry." The comic makes it look so simple, although it really takes a lot of reframing-work. Great advice, nevertheless. It really does! but just keeping it in mind has helped me a lot. I already knew it sorta, that it is a gift to allow someone to be there for you, but I still have those old attitudes from childhood about being a burden. This is a great comic, thanks for posting. This is a very good idea (and I will apply it in some situations), but I don't 100% like the take that people want to say things in the left column. Those with low self-esteem genuinely think those on the right. So I think it's preferable to make a game out of it. (Well, what I call games in this case is gradually changing a mode of behaviour without "committing" to the new mode too fast. Thus, the "game": play at it until you are comfortable with it.) The game is "what if I replaced the 'sorries' with the 'thank yous'"? — followed by the same graphics in reverse order. That's very true, but I don't think that they are mutually exclusive. For me, I both feel guilty about being a burden and also (with my more logical mature self) grateful that they are willing and able to be there for me. Yes, I like your framing better! It does help to ask "what if?" i saw this floating around the internet too and it really struck a chord with me! i now consciously try to do this whenever possible. ditto! I was distressed that something so useful wasn't accessible, so I wrote an image description when I re-posted it. I feel like I don't exactly understand the final panel: are they referring to existing not being wrong? I'm reading it as saying that you're not wrong for apologizing for existing, which contradicts the first part. 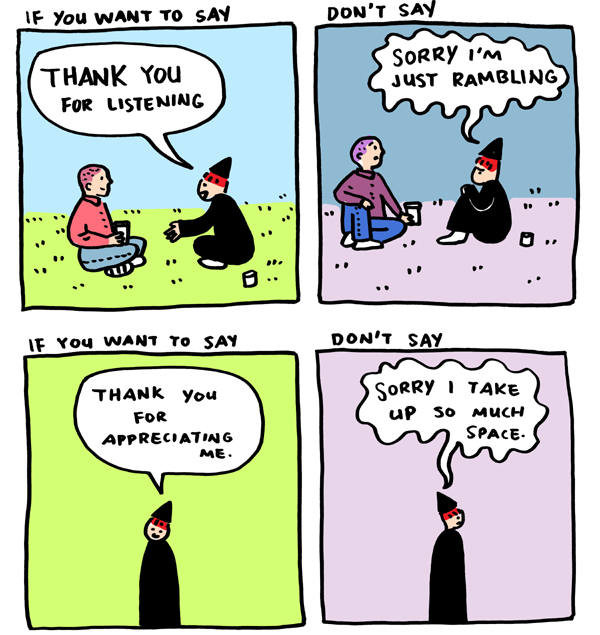 In many of these cases, I would use an apology instead of thanking someone because I don't actually know what the other person is thinking - maybe they really do think I'm a drag but are being polite. It feels presumptive to me to thank people for things if I'm not actually sure that's what they're thinking/what their actions meant. I always feel like a contrarian! But the concept is good. I'm pretty sure it means "Don't apologise for simply existing. Existing is not wrong." Seen this before but its true, hard to get you head in that mind space all the time but good thing to think about.